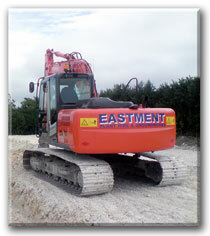 D.K.Eastment - Groundworks and Plant Hire are a well established family firm based near Dorchester, Dorset. Established in 1987, Derek Eastment has built his business from the Ground Up (pun intended). Having worked extensively with larger contractors, Derek knew he could offer a more professional and personal service than his many of his competitors, that’s why D.K.Eastement - Groundworks and Plant Hire was started. With their extensive experience in all aspects of groundworks, D.K.Eastment are available for both Domestic, Agricultural, Dairy Farms & Commercial customers throughout Dorset, Somerset and Wiltshire. With a considerable list of satisfied customers behind them, you are always assured of a personal and professional result with D.K.Eastment - Groundworks and Plant Hire. See their Testimonials Page to see a selection of what their customers say about them. They are proud of their achievements and their attention to detail no matter how small or large the project. All their customers are treated with the same care and attention and the testimonials speak for themselves.